This 5ft tall Soul Taker with Pumpkin Lamp figure is a great model to use to give an instant spooky feel. 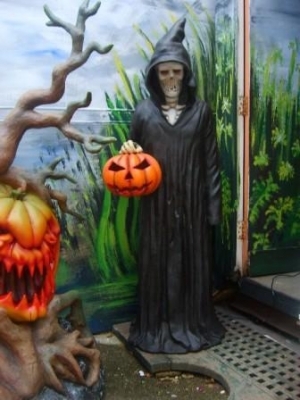 This statue of a cowled skeleton is ideal for ghost-trains and Halloween displays. This Soul Taker with replica Pumpkin Lamp is great to give a menacing atmosphere to a horror themed area as the Pumpkin lites up. 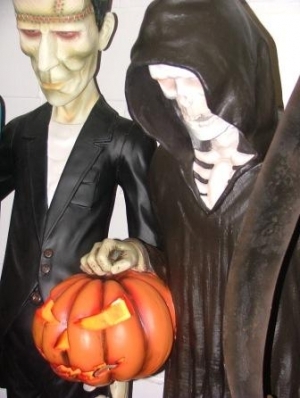 The detail on this model is great -from the textured effect of his black robe, to the bony fingers with which he holds his pumpkin lantern. 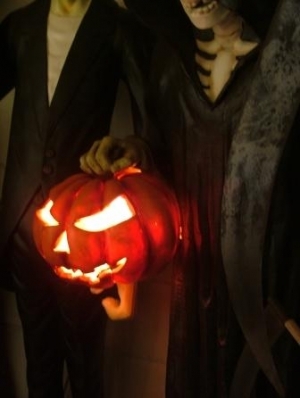 The figure comes fitted with an electric light in the pumpkin suitable for indoor use only.